Tony was a very generous and curious man, 3 years ago he contacted me about the Kickstarter campaign for the Useless Can. 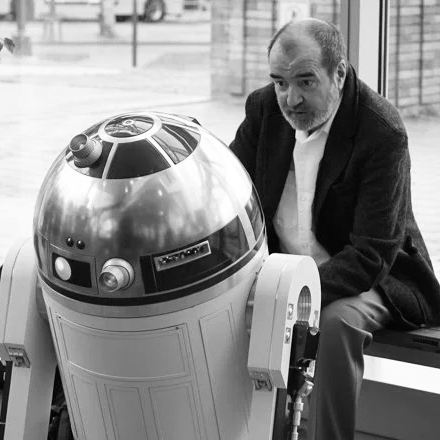 At first, I was very surprised that the man who created R2-D2 contacted me. But he was intrigued by the device and also by my different projects. I had the chance to call him many times at his home in Malta and discuss about Robots. I could send him emails for questions or advices and his answer was always: “Hi Martin, just tell me what and how I can help?” At 68, he was super active on Twitter, Facebook, Linkedin, Conferences, Tradeshows, Conventions…. just wow! He lived to the end his way of life. Speaking to Times of Malta last December, Mr Dyson said: “Be playful. Never stop playing. If you look at life the way it really should be – enjoyed – then you become very creative”.